BRIDGE OF SIGHS (OF RELIEF): It may have been a long time coming, but the new Rosedale Road Bridge actually opened nine days ahead of schedule. 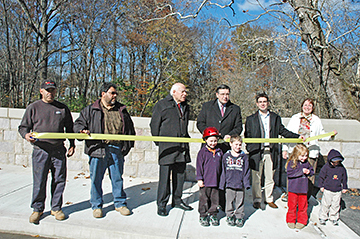 Officials present for the ribbon-cutting last week included (from left): Hernando Escobar (Interstate Contracting and Excavating), Manuel Barros (Interstate Contracting and Excavating), Princeton Township Mayor Bernie Miller, Mercer County executive Brian Hughes, Township Deputy Mayor Chad Goerner, D&R Executive Director Linda Mead, and various neighborhood youngsters. Area traffic had been rerouted since July, when work on the bridge began. The comments were all positive at a public hearing at Township Committees Monday evening meeting that discussed the filing of an application with the State Local Finance Board to create a Local Option Municipal Consolidation Study Commission. The commission would undertake the study of joint services and/or the municipal consolidation of Princeton Township and Princeton Borough. Real-life questions about the archaeological oversight (or lack thereof) of current construction work on Quaker Road followed theoretical discussions about the importance of archaeological awareness at the Historic Preservation Commissions (HPC) Monday afternoon meeting. A public hearing on an amendment to the Princeton Community Master Plan will be held by the Regional Planning Board on Thursday, November 12 at 7:30 p.m. at the Township Municipal Complex. Up for consideration is the plans Institutional and Educational Land Use Element. Amid lots of clapping and high-fives, Buckingham Place adult day program attendees took turns sending a basketball through the fold-a-hoop set up in a sunlit hall. Inside the dining room, another group was playing a lively game of The Price is Right, while a solitary man listened to Billy Joel on a set of headphones. Down the hall, physical therapist Roberta Scharff addressed the aches and pains of another group. Time is running out to see the endearing, instantly-recognizable samples of Lois Lenski’s illustrations currently on view at the Jane Voorhees Zimmerli Museum in New Brunswick. Paul Ehrenworth wasnt himself earlier this season for the Princeton High boys soccer team. One of the nice things about puppets is that it’s your own hand in there. You can make it do anything you want it to. Sad to say, but in all the visits I’ve paid to the Michener Art Museum, through six years of quality exhibits, I’m struck by how few people appear to be taking advantage of this attractive, intelligently curated resource, even on weekend afternoons. I’ve always assumed that it must be the steep admission price, which, at least for this show, has gone up to $10 for adults; $5 ages 6-18; free for kids under 6. Based on my own experience, the two most notably well-attended shows were the children-friendly “That’s All, Folks!” exhibit of Warner Bros. cartoon art in May 2005 and the current attraction, “Jim Henson’s Fantastic World,” which will be on view until November 29 in the new Syd and Sharon Martin Wing of the museum, part of a $12 million expansion that has added 11,000 square feet, including the 5,500-square-foot Della Penna-Fernberger | Paton | Smith Galleries where the Henson exhibit is located. The classical music tradition in Finland is not as well known as other European musical practices, and the talented musicians of that region are even lesser known. New Jersey Symphony Orchestra worked to dispel some of that mystery on Friday night when the ensemble presented a concert featuring the music of Jean Sibelius in Richardson Auditorium. Finnish guest conductor Olli Mustonen paired two Sibelius works with a short overture by Robert Schumann and a substantial Mozart piano concert with the conductor doubling as soloist. She has certainly been a source of inspiration. During her 24 years as Director of the Arts Council of Princeton, she guided the development of this organization into a thriving community center for a myriad of artistic endeavors.